Get Out Much? : Complete Satisfaction? Not really! 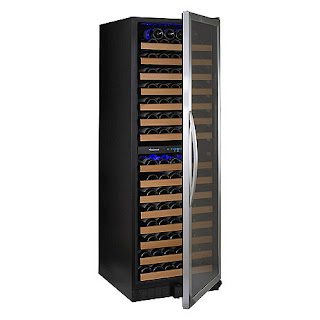 I purchased a freestanding wine cooler (wine cellar, if you prefer) from Wine Enthusiast in 2011. It wasn't the top-of-the-line, it was their own brand (N'Finity) and my assumption was that if it was good enough for them to put their name on it then it myst be a reasonably solid unit. Last summer (2015) it formed a block of ice on the rear wall inside the cooler. In hindsight this was the beginning of the end. Over course of the last six to eight months the unit has labored, running continuously while the internal temperature crept slowly upward to ambient. Initially I thought the coils were in need of cleaning, so I unloaded the contents of the cooler, fortunately not quite the 170 bottle capacity, thanks to the vagaries of inconsistent bottle sizing in the wine industry. After moving ~150 bottles (three and four at a time) I maneuvered the unit away from the wall and cleaned the coils thoroughly, checked the drain pan, wiped down the interior and exterior, and moved it back in position. I re-loaded all of the wine (not having enough counter space to allow 150 bottles to sit around and still have a functional kitchen) and waited a few hours to power the unit up so that the refrigerant would have plenty of time to settle in the system. Started the unit up and let it run overnight. Internal temperatures substantially identical to ambient temperature. Thinking that there's a lot of thermal density in those 150 bottles of liquid I give it another 24 hours. No detectable change. Cue the appliance repairman. I describe the failure mode (starting with the ice block a year ago) and he starts poking around. No refrigerant, appears to be a failed condenser. Since this is a sealed unit (read: not designed for serviceability) repairing it won't be inexpensive, but the repairs will convert it to a completely serviceable unit if/when any future issues arise. Repairman calls Wine Enthusiast, technicians are not available so he leaves a message, tells me he will call when he hears from them. A couple of hours later the repairman calls. Do I want the bad news or the worse news? Bad news - they no longer have parts because the systems were such pieces of crap that they discontinued that design. Worse news - I now own a large paperweight as no one has parts available. I have no reason to doubt the repairman, he's with a company that we've used several times over the years and they always do excellent work at fair rates, but I want to see what Wine Enthusiast has to say to a customer who has purchased a fair bit of hardware from them, this being one of two wine coolers (the other belongs to a family member) not to mention a long list of other items. So I send an email, describing the situation, telling them what the repairman said, and asking if they can help. They reply after a couple of days with instructions to give them a call. So I call. The tech is apologetic and reiterates nearly verbatim what my repair guy told me. Nothing they can do. I ask him about their Complete Satisfaction Guarantee (so boldly posted in their website.) He says there's nothing they can do. I ask if he has any idea what they mean by "Complete Satisfaction" and he doesn't. I express my discontent over having a large, 250 pound paperweight and the fact that they are selling disposable junk instead of quality products that should last more than four or five years. He finally says that we can probably find a suitable condenser from a local refrigeration supply house and offers to send me schematics and parts lists immediately via email. I wait, and wait, and wait, and...well, you get the idea. Nothing. Check the spam folder, still nothing. I fill out contact forms on their website. Nothing. It's obvious that their "Complete Satisfaction" guarantee isn't worth the electrons that it takes to display on your screen and the company could really care less about customer service. This isn't to say the folks answering the phone and email don't care (current evidence to the contrary.) But whomever conceived advertising "Complete Satisfaction" is suffering from cranio-rectal inversion and needs to read the book "You Will Be Satisfied" so they can learn a thing or two. That said, if you're looking for a wine cooler, or a corkscrew, or anything else that has to do with wine, do yourself a favor and look anywhere other than Wine Enthusiast. Their products are crap and their service is crappier. 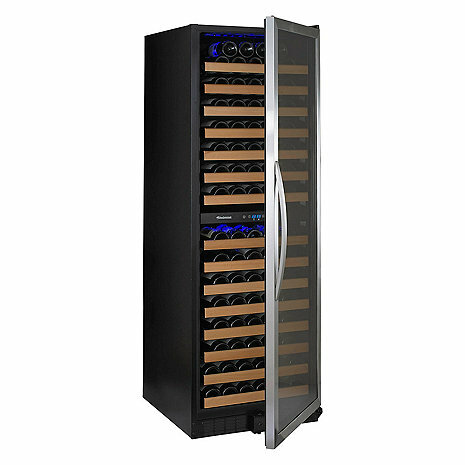 I'm in the market for a free-standing wine cooler, capacity of around 170 bottles (no larger, as they won't fit the space I have available.) Let me know if you have any suggestions.